Distinguishing Characteristics Caucasian female. Red/blonde hair, blue eyes. 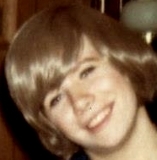 Harris wore eyeglasses and dentures at the time of her disappearance. She is fair-skinned and, at the time she vanished, was known to occasionally wear wigs. Some agencies give her name as "Diane." Harris was last seen at Big Pine Key in the Florida Keys in Monroe County, Florida on June 7, 1981. She has never been heard from again. Foul play is suspected in her disappearance. Her children were visiting their father in Michigan at the time their mother disappeared. Harris kept in regular touch with her loved ones by telephone. Her mother reported her missing after Harris did not attend her sister's wedding in Illinois in mid-August 1981. All of her belongings, including family photographs, were left behind. Harris is originally from Owosso, Michigan, and moved to Florida in 1980 after she lost her job in Michigan. She lived with Gary Vincent Argenzio in a house on Iris Drive on Big Pine Key at the time of her disappearance. Argenzio was considered a suspect in Harris's case. Approximately one week after she went missing, he disappeared as well, stealing a fishing boat and sailing to Mexico. Argenzio was arrested in Mexico in 1982, extradited to Florida, convicted of theft and sentenced to prison. He died in 1992. He was never charged in Harris's disappearance. An informant told police they believed Argenzio had murdered Harris and dumped her body in the ocean. He owned the house where they lived in 1981. The witness said he and a friend had gone to the residence and saw a hole in the wall there, with blood around it, and Argenzio stated he had driven Harris's head through the wall during an argument. The friend corroborated the informant's story. Harris's family and the family of Thomas Stump, who disappeared from Florida in 1995, believe their disappearances may be connected; police have interviewed several of the same people with regards to both. Authorities have not conclusively established a link between the two cases, however. Both remain unsolved. Some agencies give the date of Harris's disappearance as August 1981. Updated 5 times since October 12, 2004. Last updated February 9, 2008; four pictures added.